To Join - Use our New Affiliate Sign Up Form - Click Here ! 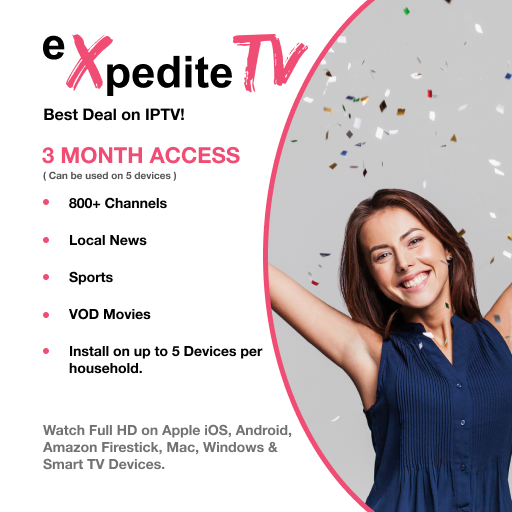 We offer a huge opportunity for you to make money offering our Free Trial offer to stream eXpeditetv IPTV service to the ever increasing cord cutters market, looking for an alternative to cut the cord to cable and satellite companies. Click here to Join for Free! FreeTrial. Use full capabilities of our IPTV service. Watch 24 hours for Free. Expedite TV Only $15 per month for the first 3 months. Regular price $20 / month. .. This is a great video to help you understand the current trend happening today as consumers are looking for an alternative tv service to cut the cord with cable and satellite companies and their high prices for televiion viewing. Take at look at your cable bill. Would $15.00 a month save you money? 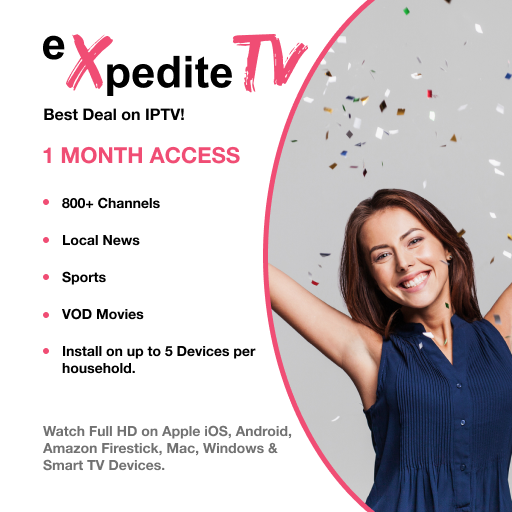 Offer our Free Trial Offer to family and friends to get their feedback and the opportunity to give them an alternative to cut the cord and switch to eXpeditetv and save money by dropping their cable or satellite company. Our Great Price of Only $15.00 a month also appeals to many millennial's including students college and high school. What devices does it work on? You can watch expeditetv on all android boxes, phones, tablets, windows pc, mac, ipad, and iphone. From our experience, you will get the best results from writing your own product reviews, even if it's short. You don't have to be a good writer. Just write what you really think about the product. When you publish your product review, use your general affiliate link (on the top) to send user to our website. You will have much better conversion if you'll put your visitors into pre-sold mood before sending them to our site. Pre-sold mood means that you build interest in product and visitor has decided to potentially buy it after he reads your product review. Choose from various types of product descriptions, download and adjust them to fit in your site. Experiment with short or long, try to find perfect combination with banners. Try to think like a visitor, when he comes to your page with review or affiliate link, you should draw his attention, build curiosity or feeling that he might need this kind of solution. Experiment with different banners, text links, or reviews. Keep these that bring good results, and change the others. Sometimes only change of few words or color of link can mean difference. Click here to joirn our team! 2. Use your blog or create a new one for free at sites such as Blogger.com, and post your review of our products, including your affiliate link. Then "ping" your blog at a site such as Pingomatic.com, so it gets picked up quickly by search engines. 3. Join popular marketing forums such as WarriorForum.com, and make frequent contributions to popular threads there. Be sure to go into your forum profile and edit your "signature". Make a signature that includes your affiliate link, or a link to your own "review" website of our product. That way, every time you make a post, anyone who sees it will see your signature and potentially click on your affiliate link. 4. Once every few weeks post a press release at PRweb.com, in which you include your favorable review of our product, along with your affiliate link. If you pay them a small fee, they will guarantee that your press release is picked up by all major search engines, potentially sending you thousands of visitors. 5. If you own an email list of newsletter subscribers or other people who have opted in to receive email offers from you, send them an email telling them about our website, and feel free to use some text from our homepage in your email. Include your affiliate link at the end of the email. You can even use our email samples. 6.Pay-Per-Click (PPC) advertising: Using a PPC account from Google Adwords, Overture, or many others, you can easily generate income with the our affiliate program. You can either send people directly to us using your affiliate link in your PPC ads, or you can create your own website in which you have a review of our product, followed by your affiliate tracking link. 7.Video advertising: Record short video rieview about our products and upload it to youtube and other video sharing websites. 8. Upgrade yourself Being affiliate is not exceptionally difficult, but there are many tricks and techniques that can improve your results. Learn from the best - Affiliate Program Management: An Hour a Day is highly recommended reading for every affiliate. 9. Be responsive If you have own website, simply talk to your visitors in real time using live chat software on your website and send them your affiliate links through chat. Traffic - Generating Traffic is the key factor determining your success online. Once you sign up as an eXpeditetv affiliate I recommend you sign up with Trafficewave. Post a free classified: click here! Get 10,000 Visitors To Your Web Site for Just $24.95 Learn more: Click Here!